Winner of multiple statues including Best Picture, Best Director, Best Actor and probably Best Craft Services at the 21st Hong Kong Film Awards, SHAOLIN SOCCER is a landmark Hong Kong film, becoming the territory’s top-grossing local movie during its theatrical run (only TITANIC had grossed more at the time). Besides being award-winning and money-making, the film is very, very good, perfectly mixing Stephen Chow’s sardonic comic style with a thrilling sports story, state-of-the-art CGI, and some startlingly effective emotional moments. 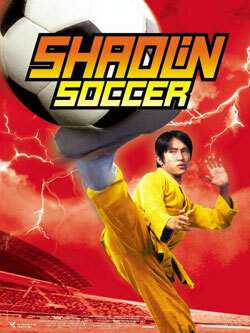 With SHAOLIN SOCCER, Stephen Chow ceased being Hong Kong Cinema’s best-kept secret and launched on a career that would inspire raving from film geeks worldwide. The unfortunate coda: he made only two more films over the next nine years. Wong Kar-Wai arguably reached his peak with his 2000 masterpiece IN THE MOOD FOR LOVE, a romantic drama that took all things Wong Kar-Wai - rampant voiceover, non-linear narratives, situations infused with suffocating longing - and actually used them less, concentrating on only two characters instead of his usual large popstar cast. The result is a far more affecting and accessible work that captures its restrained characters and their why-can’t-they situation beautifully. IN THE MOOD FOR LOVE is funny, sad, heartbreaking, maddening and sublime, and its as much due to the actors as their celebrated director. With this film, Tony Leung Chiu-Wai and Maggie Cheung made a case for themselves as the greatest screen couple in Hong Kong Cinema history. It’s possible to deny them that title. But it’s not easy. All other films had best get out of the way, because INFERNAL AFFAIRS just owned them. 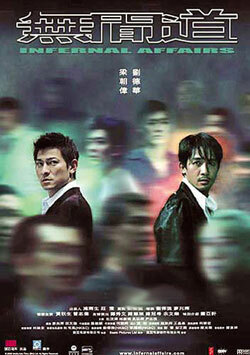 Andrew Lau and Alan Mak’s crime thriller received 879 points, a full 367 more than its closest competitor. That is an obscene margin of victory, turning this “Best of the Decade” vote into a full-on blowout. Whereas SHAOLIN SOCCER and IN THE MOOD FOR LOVE duked it out until the very last day for second place, INFERNAL AFFAIRS took charge on day one and never looked back. As for the movie itself, it grossed $55 million at the Hong Kong box office (at the time, trailing only SHAOLIN SOCCER and TITANIC), won multiple Best Picture awards, spawned two popular if not acclaimed sequels, and got remade by Martin Scorsese as an Oscar-winning film called THE DEPARTED. When giving it a first-place vote, LoveHKFilm reader Lord Garth said “Yes, it is that good.” Obviously, many people agreed. And that’s it! I hope you’ve enjoyed this Top 50 Hong Kong Films of the Decade vote despite the shameless destruction wrought upon all other films by INFERNAL AFFAIRS. Johnnie To was the big winner with 12 films (13 if you count the To-produced HOOKED ON YOU) making the Top 50, though even Mr. To could not crack the Top 3. I’m sure he doesn’t mind. Again, thanks to everyone for participating! In a few days, I’ll post a full list of all the films that were voted on, plus maybe a few fun stats. I had a lot of fun putting this together and look forward to doing it again, though I do wonder how I’ll find the time. In the future I hope to write some film reviews too. This entry was posted on Friday, January 1st, 2010 at 7:59 pm	and is filed under Top 50 Movies of the Decade, Awards. You can follow any responses to this entry through the RSS 2.0 feed. You can leave a response, or trackback from your own site. Kozo, thanks for putting so much time and effort into putting together this list. I am sure everyone has had a lot of fun voting and then finding out the results. If you have the time, and think it’s a good idea, could we vote on the Top 50 Asian Films of the Decade some time in the future? And Happy New Decade to you too! Thanks Kozo, it was really funny participate and follow the countdown. For Top10 90’s I have four movies number one. But after thinking a lot I elected which movie will be the number one. No IA3??? I thought the last one was not great but good enough on the list! Especially the scene where it ties back the first one when Andy and Tony meet at the audio store. Excellent! This was truly fun. My first activity of the day for the past few days was reading this column. Thanks, Kozo! Always a great read! Aww, I’m sorry it’s all over! Now I’ll have Kozo withdrawal for a while. Nice job lovehk readers and thanks Kozo. In the Mood for Love isn’t my favorite WKW film but it was second on my list behind the legendary Infernal Affairs. I never voted for Shaolin Soccer. Can’t remember if I voted for Goddess of Mercy or not. How many Johnny To films are on this list? Seems like so many. Hey, inspired by that false post, why not make “the worst HK movies of the decade”? Thanks, Kozo, for putting in all the time to compile the lists and write the film descriptions. I’ve watched 43/52 on the list. I was pleased to see Cecilia Cheung show up in several well-ranked films. Tony Leung and Johnnie To rightly stand out for their versatility across genres. Their representative films that appeared near the top of the list were, if not my first picks, usually in my top three. Well, I finished with 30 of 52 and I suppose I had better make “In the Mood for Love” #31! I’ve followed lovehkfilm.com for a few years now, but have never been on the forum, so this has been my first participation, Thanks Kozo! valerie soe…white dragon is fantastic! This is now my “films that are great that I haven’t seen yet” list. It was a lot of fun to read; thank you Lovehkfilm for putting the time and effort into making the list, with good descriptions of each film too! What!? !… No Ekin on the Top 3! Thanks Kozo and the voters. This list was awesome. I am surprised by the margin of victory by IA1. But not surprised bye the top 3 or the top 20 for that matter. Like Ben and Valerie mentioned, it was something I looked forward to every morning and will have withdrawal now. And like Chris Wolter, I’ve been a reader for years, but this made me participate with the rest of the community for the first time. Looking forward to the list of all the movies voted on. This list is great! Even though my Top Ten was vastly different it showed me I really haven’t seen much in the way of HK films yet. I only started watching about two years ago and a lot of what I saw wasn’t on the list. I just counted and I have only seen 12 movies from this list, but in my collection at home I have 28 of the movies ready to watch. I’m now on a hunt for most of the list to add to my collection. On a funny note, my girlfriend and I were movie hunting yesterday in Taipei for some of the movies on the list and found Love Battlefield in a bargain bin at Blockbuster for 10nt (35 cents US). They had about ten copies of it! We actually got five movies from the list for under 100nt each… Isabella, Love Battlefield, PTU, After This Our Exile and Needing You. but do we have to wait every decade??? thats a long time to go..
seen 25 of them. only one that i’ve not seen is something i feel i would like to see : red cliff. surprised at this, because i’m 50/50 on john woo, and i usually don’t like those epic things. i like the more intimate crime dramas that HK turns out… a little on the light side compared to some stuff turned out elsewhere, but relatively solid and always underrated by non-HK film fans. Thanks for putting all that together, it was an interesting read. Incidentally, I just bought Infernal Affairs this afternoon - I saw it at the cinema and loved it, but haven’t seen it since and realised today as I was walking through a CD shop that I don’t own a copy of it. It occurred to me, as I was reading the list, that I haven’t watched many HK films this decade. Damn Kozo that was alot of fun!! Some of my films made it to the list (I’ve seen 43 of 52) albeit ranking very low - need to watch the rest soon. I recently saw an interview where Sandra Ng mentioned that Golden Chicken opened opposite of Infernal Affairs so that year was not a loss at all. any possibility of a top list by the kozo and/or the rest of the staff? Kozo, thanks a lot for organizing this poll and putting this list together. It is very interesting to see how high or low some of the films scored. A comparison of one’s personal picks with the collective opinion of 150 others is also quite appealing. There are 7 films out of these 52 that I haven’t watched yet- got to get to them as soon as I get back home from vacation. Btw Kozo, did you cast a vote as well? If so, would you consider publishing your personal picks? Kevin has a Top 10 list because he sent it in for the vote. As for publicizing it, I don’t know if he plans to, but he can on The Golden Rock if he wishes. @V, I came up with my Top 10 (or maybe 15) list during the voting process, but since I was very aware of how much I could affect the vote (e.g. IN THE MOOD FOR LOVE and SHAOLIN SOCCER were never separated by more than 1-2 votes at a time), my choices were not factored in. I’ll probably publish them later, but after a post mortem on this vote, and maybe a few other random posts. I’d like to do another poll like this soon. This one seemed to work out very well, and I personally enjoyed it a lot. I might throw that discussion out there in a couple of days. Darn, I have lots of movies to watch! Personally, I think Johnny To and Derek Yee were the two most exciting directors of the decade. i’ve really got to watch ‘my left eye sees ghosts’ sgain because i was really unimpressed with it the first (and only) time i saw it but a lot of ppl seem to enjoy it. i don’t mind slapstick and sillyness but it was too much even for me, hm..
i’m a bit sad fruit chan’s hollywood hong kong and dumplings didn’t make the list. the first enchanting and the latter extremely solid all round but i guess they are not the most popular of films (in terms of talking points/stars/viewing). Man I should have got around to sending in a list! Too, too fun! Ashamed to say I missed the voting but the list is great. After tallying my totals I was amazed to discover that I’d seen 41 of the 52 films on the list and all but four were in seen in actual U.S. movie theaters. On top of that I could’ve seen, but actually passed on, four more films featured on the list. I guarantee the next decade won’t be as fruitful for those of us that like our Hong Kong movies bigger, louder, and rowdier than we can get them in our own homes. Biggest disappointment was that DUMPLINGS didn’t crack the list – it was in the top 10 of my top 60 HK films of the decade. Biggest surprise was seeing PERHAPS LOVE on the list. Of course my favorite part may be the top three fake outs – LOL! I was in that packed premiere audience for THE WESLEY’S MYSTERIOUS FILE at The Four Star and you could hear a pin drop as we all sauntered out being careful not to look one another in the eye – haha. In hindsight I can’t believe I expected the movie to be much better than it was! Thanks for the laughs Kozo. Well The Way We Are was in my list - but I voted for ITMFL as the best film. I’m happy with the top three films of the decade, they are faves and stand well to rewatches and diverse enough to appeal any new beginner. totally agree with 1 and 3rd place, in the mood for love, hmmm…….Wong kar wai deserves a spot too!! and etc… I know it’s a lot of work but it’s definitely going to attract of traffic.